Castleman’s Corkscrew was the first railway line to pass through Brockenhurst. It opened for business in 1847, following the 1840 opening of the line between London and Southampton. Castleman’s Corkscrew, effectively, extended that line, through Brockenhurst and on to Dorchester. The start of the now disused part of Castleman's Corkscrew can be seen by following the Streetmap link above, and paging west a couple of times. A circuitous route was taken for the extension, taking in Ringwood, Wimborne, Poole Junction (now called Hamworthy), and Wareham, but missing out Bournemouth, which then was little more than a fishing village, and Christchurch, too. 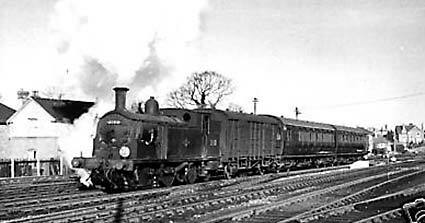 (In fact, the more direct Brockenhurst-Christchurch-Bournemouth line was not fully opened until 1888). The 1847 line had been promoted by Charles Castleman, a Wimborne solicitor; and the winding route from Brockenhurst to Poole Junction soon became known as Castleman’s Corkscrew. Castleman’s Corkscrew left the current main line to the south-west of Brockenhurst (A) - where the Lymington branch line now separates - and from there, cut through Blackhamsley Hill, which once was known as Blackhamsley Hummock. It was, though, shown by Richardson, King and Driver in the late-18th century as Blackhamsley Hammock, which was maybe a misspelling, or reflected the map-makers sense of humour. The railway skirted Hincheslea Bog, crossed the A35 at Holmsley, and left the New Forest close to Bagnum, en-route for Ringwood. Castleman’s Corkscrew closed to passenger traffic in 1964, and the section between Brockenhurst and Ringwood was then completely closed. A small section of the route, close to the A35 alongside Wilverley Inclosure, was taken for a new road, allowing a notorious accident black-spot, the crossroads at Wilverley Post, to be closed. But much of the rest remains, open for recreation to walkers, cyclists and horse riders. Following closure, wildlife was inevitably quick to colonise, and to a large extent, was probably present anyway. Nightingales, for example, not too many years ago, bred in dense scrub along the early part of the route; nightjars hunt over the old track-bed; south facing embankments attract basking adders, lizards and other reptiles; and the numerous wetter places along the way are frequented by a sometimes bewildering variety of dragonflies and damselflies. So more than 160 years after it opened, Castleman’s Corkscrew in the New Forest continues to provide a great resource for local people and visitors; whilst also helping wildlife to prosper.